In Yingelishi, Stalling engages the questions about repetition and understanding raised by technologies of reproduction. He also addresses the tradition of associating bad repetition with those who do not share one’s culture, language, class, accent, or religion. This tradition, as Christopher Bush has brilliantly shown in Ideographic Modernism, is key to understanding Western modernists’ revaluing of Chinese and the intertwinement of the Western imaginings of the Chinese language with responses to new media. In Yíngēlìshī, Stalling repeats a text designed to help one speak another language without really knowing it in order to allude to the prejudice, held by major Western thinkers such as Hegel, that to write or speak in Chinese is merely to repeat not to understand. Yet Stalling presents his work as turning this idea on its head. In his introduction to Yíngēlìshī , he attacks the racist term “Chinglish” and the way the term, like Margaret Mitchell’s Gone with the Wind, equates the failure to conform to an approved accent with a lack of understanding. 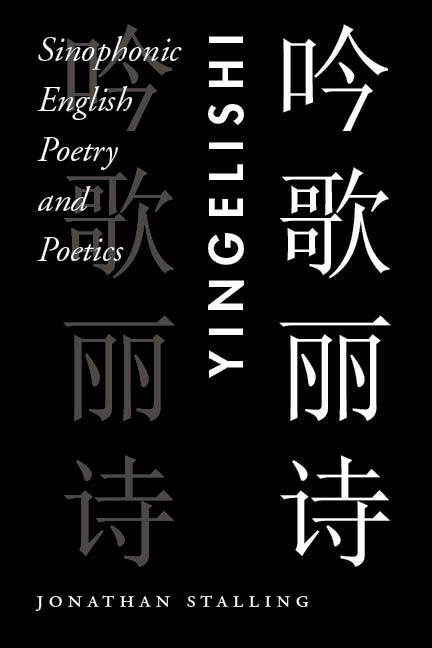 Stalling revalues Chinese-accented English as “beautiful”––as in the “lìshī” 丽诗 (“beautiful poetry”) of title Yíngēlìshī. Stalling also inverts the relation of linguistic mastery so that the English-speaking reader is confronted with not understanding the true meaning of apparently English words. Indeed the “mysteries” (mí 谜) of the Chinese text are not even fully unraveled by translation. In the line in the video above, the translation of “fú” 浮 as “impermanent” misses the economic meaning of “inflated,” “surplus,” or “excessive,” which connects to the business lexicon of the previous line. Are we just mouthing without understanding and what does understanding mean? Stalling’s answer in his introduction to Yíngēlìshī is instead to deny the importance of meaning and to insist on the primacy of sound. But in fact, Stalling’s poems work precisely because of the interplay of multiple meanings, not the absence of meaning. The video above is a small extract from a digital version of Yíngēlìshī, which also exists as a printed book and as a performance piece. The digital version connects the question of whether we read these texts as Chinese or English to the question of whether we listen to them or see them, and to the question of whether we attend to the print or digital or live performance versions. Among versions and languages, between the written, spoken, and sung, between the print and the digital, Stalling’s work asks: where in all these copies does the meaning lie? It also highlights the ethical and political stakes in answering this question.